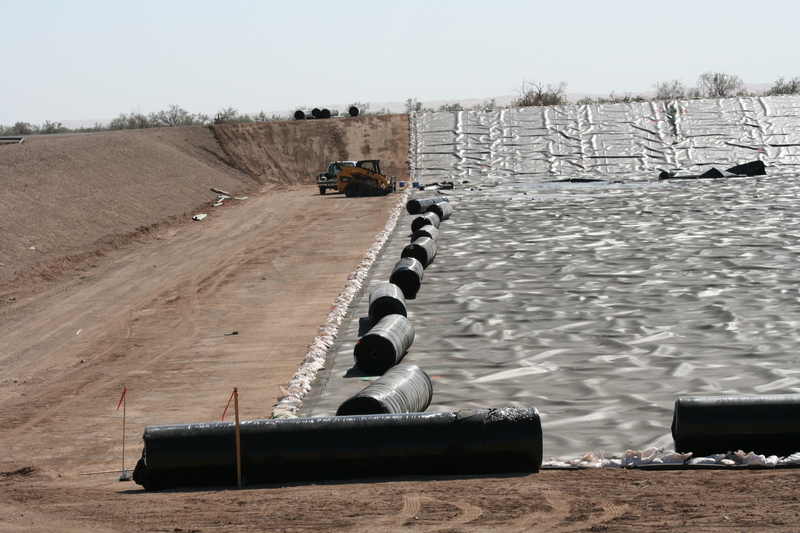 A protective membrane covers the liner system installed for Cell 1 of the Mesquite Regional Landfill. The 5-foot-thick liner installation was completed by Sukut on December 12th. The membrane protects the liner from the elements until landfill operation begin. Natures Image crews clear the shrubs from the 150-foot-wide corridor in which the rail spur for the Mesquite Regional Landfill will be built. The spur will extend about 5 miles from the Union Pacific main line near Glamis to the landfill. A three foot thick layer of dirt is placed to protect the composite liner system below from the heavy equipment that will be used to compact and bury trash. The composite liner system includes a gravel layer, high density plastic liner, and an engineered clay liner. Tortoise proof mesh is added to a chain link fence along the perimeter of the landfill. The tortoise mesh is installed 12 inches below ground and extends 24 inches above ground to keep desert tortoises out of the active landfill area. A third party inspector is hired to inspect each of the welds joining sections of high density polyethylene plastic liner. This plastic liner is the impermeable portion of the composite liner system and requires extensive field-testing to ensure its integrity. 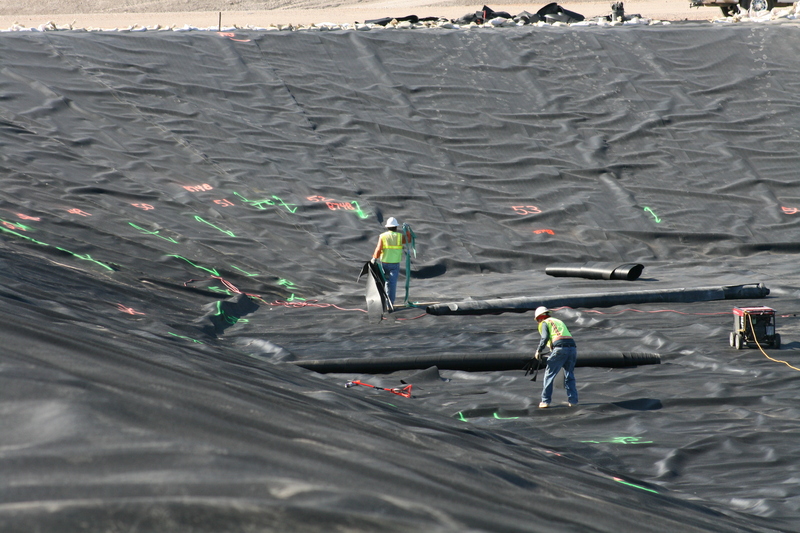 During construction, sand bags and rolls of liner material are used to keep liner in place. The composite liner system being constructed at the Mesquite Regional Landfill includes a gravel layer that would transport liquids coming down through the refuse. Any liquids collected would then be pumped out for treatment and disposal. Two more groundwater wells were added to the exisitng groundwater monitoring system at the Mesquite Regional Landfill. The groundwater is sampled, analyzed, and the results reported to the Regional Water Quality Control Board to monitor the integrity of the composite liner system. 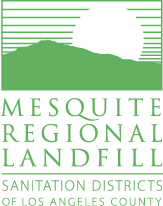 Administration buildings, security fencing, and storage areas are completed for the operations facilities at the Mesquite Regional Landfill. Granite Construction is the contractor for the project. A trench is dug around the upper edge of the first cell at the Mesquite Regional Landfill as part of the composite liner installation. The edge of the liner will be placed in the trench and firmly anchored in place. Rolls of synthetic liner and geosynthetic clay liner are stacked at the Mesquite Regional Landfill site awaiting installation as part of the composite liner for Cell 1 of the landfill. When complete, the liner being installed by Sukut will be more that 5 feet thick. Large steel canopies, installed by Granite Construction, shade concrete slabs at the Mesquite Regional Landfill that will be used for storage and equipment maintenance. Truck scale installation at the entrance to the Mesquite Regional Landfill is completed in anticipation of the landfill becoming operational by the end of the year. Sukut Construction prepares the subgrade for liner construction. An environmental monitoring system will be located in trenches below the liner to confirm the liner functions properly. The final phase of construction of the modular buildings begins at the Mesquite Regional Landfill. Granite Construction is installing plumbing, indoor electrical service, and completing skirting for the buildings. Sukut Construction screens on-site material for the foundation layer of the composite liner being installed in Cell 1 of the landfill. A third party quality control consultant oversees each aspect of the composite liner construction. Modular buildings are moved to the Mesquite Regional Landfill site for installation by Granite Construction. The buildings will house the landfill's administrative offices, and trades and mechanics shops. liner is about 5–feet thick. 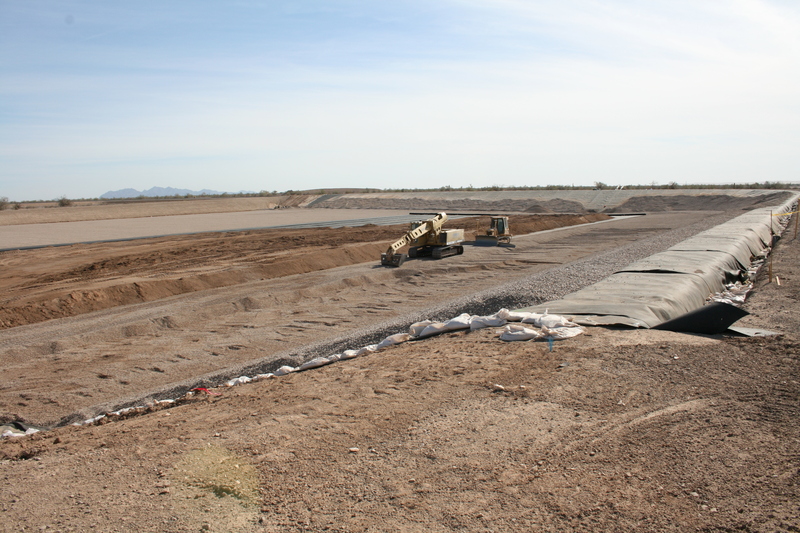 A heavy equipment maintenance pad nears completion at the Mesquite Regional Landfill. Granite Construction was awarded the contract to complete the operations facilities. A truck scale awaiting installation sits beside the access road inside the entrance to the Mesquite Regional Landfill. The scale will be used to weigh trucks bringing trash to the MRL. Granite Construction crews finished the earthwork for the petroleum storage and fueling facility at the Mesquite Regional Landfill. The fuel station will support the heavy equipment operations the landfill. Graders and earth movers completed work on a series of rain water diversion channels designed to protect the future landfill, rail yard, and facilities from potential stormwater damage. Water depth markers were installed in low lying areas of the new access road into the Mesquite Regional Landfill. When washes are full of storm water, the markers will indicate the area is not safe to cross. A new left turn lane on eastbound Highway 78 was completed as part of the Mesquite Regional Landfill site preparation. 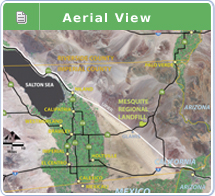 In addition to the new turn lane, the project included a new access road that is shared by the Mesquite Regional Landfill and the Mesquite Mine. Earth movers shaped a large storm water diversion channel as part of a $25 million project to prepare the site for the landfill. Granite Construction was awarded the contract that included the construction of roads and drainages for the project. The Mesquite Mine access road was relocated 1/2 mile east of the previous entrance on Highway 78. The landfill and the mine will share the new road. Imperial Irrigation District crews installed the power lines that provide energy to the Mesquite Regional Landfill. Site preparation work included the installation of a water line. 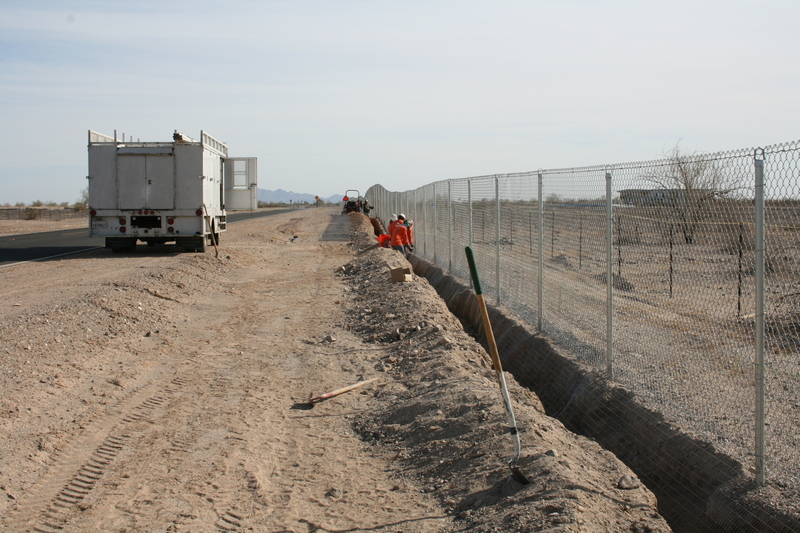 Environmental safeguards being used during the construction process included a rope fence to keep construction workers within the construction zone and off native desert vegetation areas. Silt fencing was erected to minimize erosion of the construction areas during storm events. 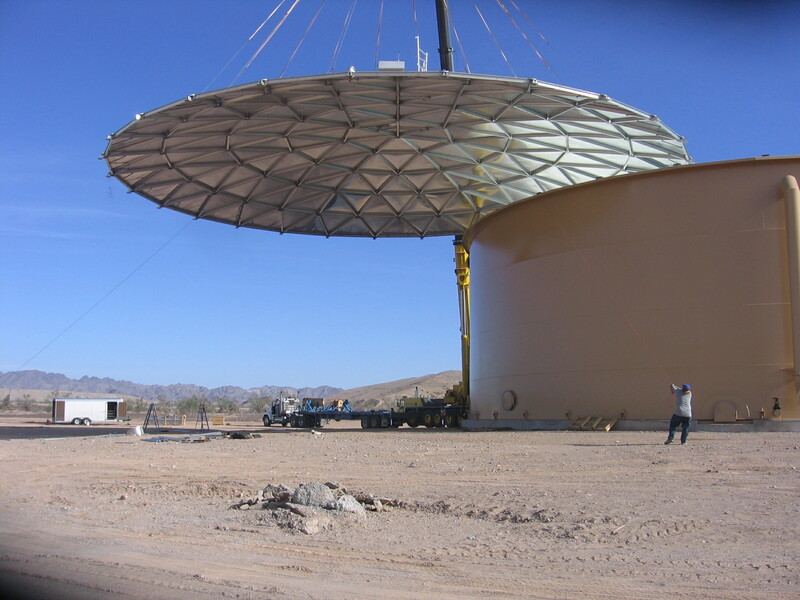 The roof was installed on the 2 million-gallon water storage tank for the Mesquite Regional Landfill. The water is pumped from wells the landfill shares with the Mesquite Mine and is used primarily for dust control at the site. 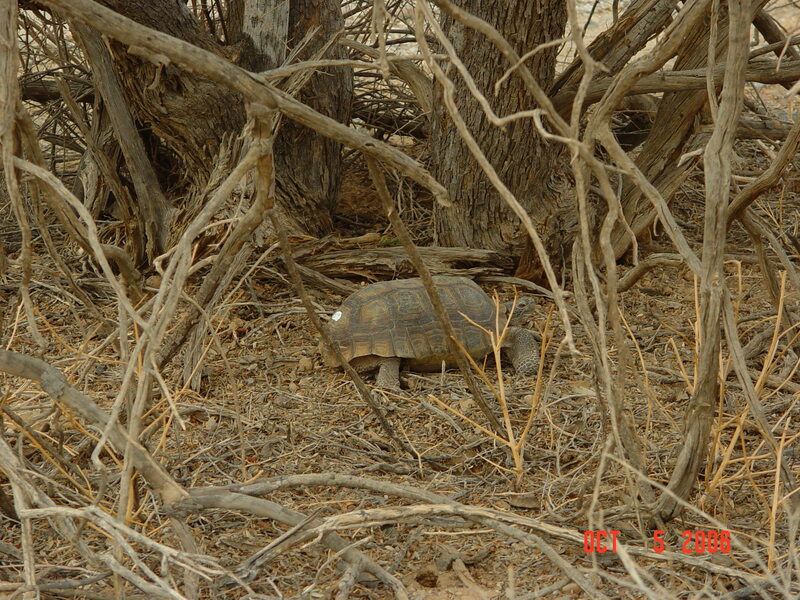 Site preparation for the Mesquite Regional Landfill included an extensive program of locating desert tortoises on the property and moving them to suitable habitat. The fence is made of a material that will not injure the tortoises. Signs are posted along the fence to remind the public to protect the desert tortoise. Solar-powered automatic gates were installed at the entrance to ensure the perimeter remains closed after a vehicle enters. Shown here, between the Mesquite Mine overburden piles to the north and the landfill property, a fence was installed around the perimeter to keep tortoises out of the site. This fence includes a tortoise proof wire mesh that extends one foot below and two feet above the ground.